Here are some that are totally easy to do. Best of all, these are effective and bring on a feel-good factor in the peak of summer. 1. Replace water with rosewater. It keeps your skin luminous and fragrant throughout the day. It's a good toner too. 2. Cleanse your skin by combining these ingredients - honey, milk, rosewater/rosepetals and turmeric. Add a dash of olive oil and yes, it feels wonderful. 3. Almond oil body baths are a must-have! You will smell delicious all day. This summer, skip all those body lotions & moisturizers! You will love the way almond oil pampers your skin all day! 4. Use a mixture of almond oil and olive oil for your feet. Your feet will sparkle and look as good as though you have stepped out of a beauty salon. 5. Here's what my buddies in Delhi recommended and it sure worked wonders: A dash of milk, mashed tomatoes and a dash of turmeric does wonders to clear your summer tan. 6. Coconut milk is a fantastic cleanser and moisturizer for your skin. Try this once in a while when you want to indulge yourself and feel pampered too! 7. Potato juice as well as lemon juice are recommended by experts for those who want to bleach their skin naturally. Try and see how this feels on your skin. I am yet to give this a try but I have heard and read that it's good and it works. 8. When you want to opt for a natural scrub, use milk, a dash of olive oil, honey and sugar crystals to scrub your skin. Make sure you don't scrub or tug your skin too hard because it sugar crystals can tear/bruise your skin if you are not careful. But for a feel-good, natural scrub without any chemicals, this one should do the trick easily and effectively. 9. Raw milk and turmeric face mask: Need I say more? You will look and feel the glow on your skin. 10. Make sure you load up your plate with lots of seasonal summer fruits such as watermelons, mangoes, musk melons, green grapes and so on. Have this fruit platter before breakfast every morning. This does wonders for your skin, your metabolic rate and your overall body fitness. It boosts your system altogether and you will feel the difference in energy levels throughout the day. And here's a last secret tip: Drink lots and lots of tender coconut water. It's the best recipe for a glowing, luminous feel-good skin! Great tips. i will share this tips on my facebook a/c. thanks. Great tips! They are all practical and effective. I already use rosewater on my face; and really it smells nice and cooling on my face. For my body, I use parachute summer fresh body lotion. It has coconut milk; I had read somewhere that coconut oil/milk is very good for deep nourishing. Hence I use it and true to its property, not only my skin feels hydrated but its mint extracts also keeps my body cool the day long. That's a very kind of you, Swapna that you shared such a useful skin care tips with us. I will follow your suggestion as my daily skin care routine. Many thanks, glad that you found it useful. I do hope you'll mention this blog too. Many thanks Preethi, glad to know that you liked this post and the tips. 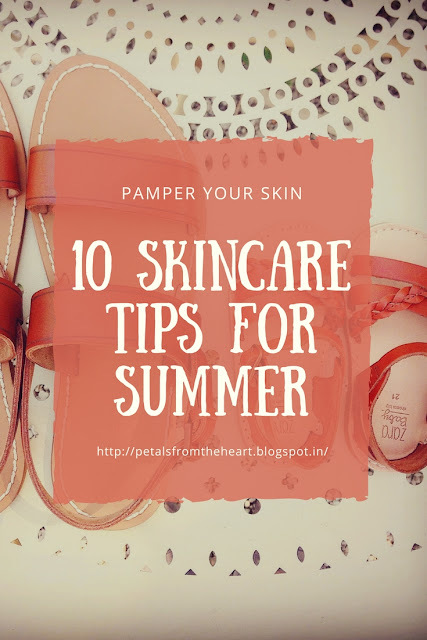 Good to hear that you are already doing the right things for your skin especially as summer has begun in full swing now. Thanks Alison, good to know that you'll be incorporating some of these tips into your daily skin care routine. Great tips provided. I also wanted to add one, that is Stay Hydrated. Your body tends to lose a lot of moisture in the summer, so it’s important to regularly replenish the H2O. Drink a lot of water and liquids and your skin will stay soft and moisturised as well. Thanks foor sharing your thoughts on GOSMACS. to your articles. I'll bookmark your weblog and test once more right here frequently. I'm relatively sure I'll learn plenty of new stuff right here! I have read this submit and if I may just I want to recommend you some fascinating things or advice. close down. Entomology means the scientific study of insects and can be seen as an independent branch of arthropodology. Actually, there are no "toxins" in cellulite, that's a complete production made up by promoters. Cool tips for Hot summer!! I tried some of the tips and it's supa! !